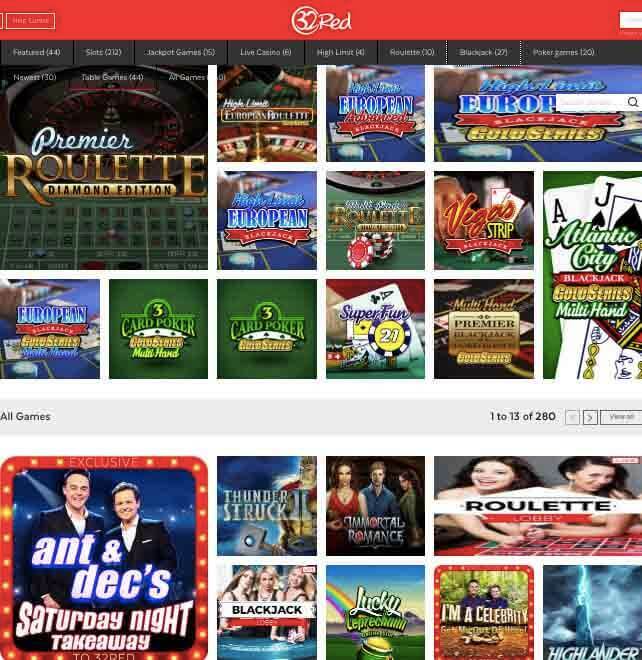 32Red is one of the UK’s most trusted and popular online casino and rightly so. It has proven itself over the years with high-quality games and software, courtesy of one of the industry’s top supplier – Microgaming. We found it quite interesting, that a major casino could run with mainly one big provider, so we took special care in our 32Red Casino review to find all the pros and cons! With an astute attention to customer service and a diverse selection of high-quality games and mouth-watering promotions, 32Red Casinos, it seems is here to stay. Bear with us while we give you all the details about this online casino. Here are the results of our 32Red Casino review. Almost all countries except USA, Afghanistan, Albania, Algeria, Angola, Australia, Austria, Belgium, Bulgaria, China, Christmas Island, Cocos (Keeling) Islands, Colombia, Costa Rica and more. We recommend visiting 32Red’s site to get a full list of countries where 32Red casinos are not accessible. 32Red has seen its fair share of success over the years for its quality games and also the support it provides to the players. Starting from the excellent gaming experience to inviting bonuses and welcome offers, 32Red has it all. Let’s take a quick look at the software and game offerings of 32Red Casino. 32Red uses Microgaming as the primary provider of its games in terms of software. The casino has stuck with the reputed company, a smart decision considering they have over 20 years of experience right from the start at 2002. So, it is needless to say that 32Red is well-taken care of from the games and software side of things. In addition to the diverse selection of quality games from Microgaming, you can you can also use the demo mode feature to try out new games – a great way to test the waters before you fully dive in with real money. This gives you an idea of how the games play out and let you get the hang of it before betting your big bucks. With a huge selection of 380 different titles, players are sure to find the perfect game for themselves. Moreover, there is a wide betting range for the games which enables players of any financial level to give it a try. You can bet small and just try out your luck or you can bet like a high roller- the choice is yours. Featuring a staggering number of 300 games which span over a wide range of variations like classic slots, video slots, and 3D slots. You can also try your luck with 32Red’s quality collection progressive slots like the popular Mega-Moolah and other crowd favourites which include Game of Thrones, Immortal Romance and Jurassic Park and take fandom to a whole new level. 32Red holds on to the classic slot option as well. 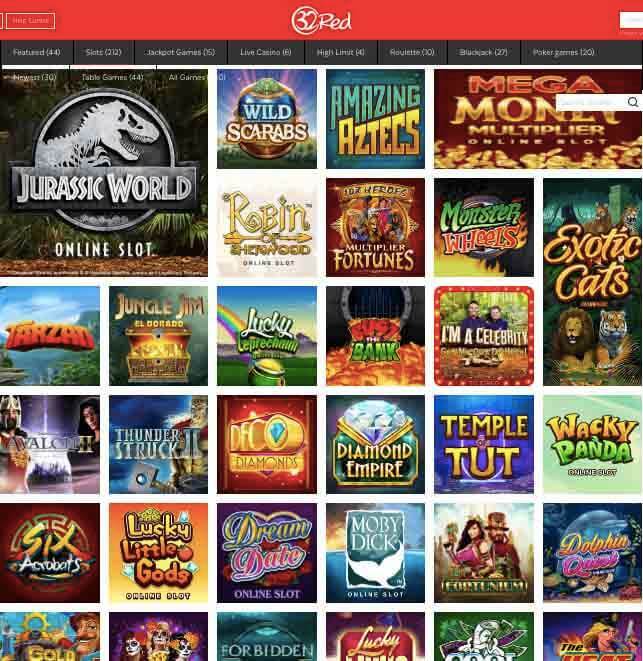 Whereas most of 32Red’s competitors offer somewhere between 5 to 10 classic slot reel titles, 32Red offers tens of these titles including Jurassic Jackpot, Pharaoh’s Fortune and so on. As mentioned above, one of the major highlights of the slots is its wide betting range – with an overall minimum of 1p to a daring maximum of £27000. 32Red’s minimum on most slots is 1p-£1 and max being £6-£1250 per spin, you can be sure to have a good time with their fun-filled slot games, irrespective of your financial status. And if slots are not your thing you, there is really no need to worry. You can still enjoy the casino with lots of other types of games that are at your disposal. Blackjack is another one of those popular options for players who’d like something different from slots. With a wide range of 70 different titles, there’s plenty of option for blackjack fans to choose from. However, it comes with its own betting limits: a minimum of £1 and maximum of between £200 and £25000 since high tables have to be more than £100 as per the rules. 32Red Casino also offers many other games such as roulette, within which lies 10 different titles that players can choose from. Popular Table Card games and even poker is available if you’re a fan of those. Not just that, 32Red’s video poker is among the best in the industry! With Microgaming behind their software, this should come as no surprise. Again, there are around 60 titles that players can choose from including progressive jackpot titles if you want to win some big bucks. Exciting Bonus and Promo Offers: 32Red Casino No Deposit Bonus and Much More! Players will get £10 right at the beginning of registration, courtesy of the casino. You do not need to deposit any money to avail this amazing offer! Also, you have the option to start playing any game with this amount right away without having to spend any of your own money. Players will get matched either 100% to 200% of their initial deposit on their accounts with a maximum cap of £160! From 30th July to 13th August playing roulette, if your ball lands a zero but you didn’t win the bet, 32Red will refund 10% back to you. The offer, unfortunately, is not applicable to ‘American Roulette’ and ‘Double Ball’. You can easily become a member of their Premium club. If you think your account is eligible, you can ask to be reviewed for a VIP membership. There are some terms and conditions to be kept in mind though. For starters, only platinum loyalty tier is eligible to join. Membership gifts where one lucky member can get two bottles of premium Cohina Esplendido champagne, Cuban cigars and chocolates! Players have the chance to win loyalty points which also bring them unique bonuses. There are 5 loyalty tiers that come with their own set of entry and tier requirements and benefits. The higher up the loyalty tier you are, the more the bonus points you get along with other benefits such as personal promotions and additional bonuses. You can visit 32Red’s promotions page for a more in-depth breakdown of their loyalty program. The ‘dish of the day’ refers to a range of various bonuses offered to players each day to keep things interesting. It makes sure players get a bonus everyday big or small, and keep them coming back for more. You can always visit 32Red’s promotions page for more details. 32Red offers an amazing mobile experience for the players who are looking for excitement on the go. They have a very well-designed app for both iOS and Android platforms. Players can either download the dedicated app or play using their mobile browser. The mobile version of the casino has 160 titles and live dealer’s mode is available too in mobile casino. The overall experience of the mobile version is no different in quality compared to the full desktop version in terms of gameplay and responsiveness. Withdrawals are also pretty easy and the process is similar to the desktop version. This way you can deposit money in your account or withdraw on the go. You can choose to access the mobile version of the site using the dedicated app from Android or iOS. However, you need to have iOS version 4.3 or above to be eligible to download. The interface is similar to the browser version. The games scale perfectly on the smaller screen without feeling cramped and restrictive. 32Red manage to offer an enjoyable experience on the go. While the app is available only for Android and iOS versions, blackberry and Windows Phones users can access the mobile version of the casino through the mobile version of the site. But we recommend downloading the dedicated app if possible for ultimate gaming experience. The site is responsive with tasteful splashes of color and accents. 32Red has done a really great job optimizing its mobile site for smaller screens. 32Red offers a respectful live casino experience with professional live dealers and very high-quality streaming courtesy of Evolution Gaming. You can choose to customize your setting from the streaming quality, background sound and even disable the chat feature if you prefer to do so. 32Red also lets players play multiple tables at once (up to 4 tables where most other casinos offer 3). You can either view them in a 2×2 grid or have one full screen and three smaller windows off to the side. 32Red’s altered policy on June 2013 does not let you cash out on the weekends anymore. Moreover, they also implemented a reverse pending of 24 hours; this means when you make a request to withdraw, you can still choose to use the money to bet for 24 hours, but the casino also offers a manual flushing service which makes sure the cash out is processed the next day. All the convenient payment methods are available over at 32Red such as PayPal, Neteller, Skrill, ECOPayz, Entropay, Paysafecard and wire transfer. No fee is charged by 32red for the transactions, however, some credit cards issuers charge a cash advance fee when depositing. It is recommended that you contact your card’s issuer for further details on this. Though, it is important to keep in mind that local banks could charge for the wire transfer. All processes are instant for debit/credit cards on withdrawal and deposits. But Entropay has a withdrawal processing duration of 3-5 days and all other withdrawals remain pending for 24 hours before processing starts. 32red will instantly process the withdrawals back to the cards that were used to make the deposit. But do note that for Visa and MasterCard schemes, it is not possible to process refunds to any foreign cards. Minimum withdrawal is £10 for almost all methods. The maximum withdrawal cap which equals to £120,000 per day. Additionally, players can withdrawal with almost all methods supported but withdrawal via Paysafecard is not supported by the casino. There is a £10 minimum on deposits. 32Red’s customer service speaks for itself. Having won the best customer service award, it is quite easy to see why 32Red has become so popular as it is today. Players can get in touch with the casino in a variety of ways. They can choose to email them or directly call, Skype, fax or join them in a live chat. The live chat service online is available to all players 24/7 but may take a while to connect. No matter what difficulties players may be facing, 32Red’s polite and competent customer service reps will definitely help you get your problem sorted in no time. Founded in 2002, 32Red has earned its spot as one of the most trustworthy casinos in the UK. This 32Red PLC owned company is licensed by the UK gambling commission and traded on the stock exchange. It has won multiple awards including “casino of the decade” by casino forum Casino Meister. They also offer other gambling services like bingo and sports betting. The company is a big supporter of responsible gambling – they support GamCare, Gamblers anonymous and gambling therapy. 32Red Casino has always prioritized security. It is important to have a robust security system, especially where you deal in real money with the clients and the casino acknowledges that. 32Red uses an industry standard 128-bit encryption that facilitates safe and secure transactions making sure the data will not end up in the wrong hands. All the games offered by 32Red are certified by respectable authorities so you can rest assured of the fairness of the games. The licenses source from UK Gambling Commission and Gibraltar Gambling Authority. Moreover, 32Red is also awarded an eCOGRA certificate that audits the sites for payouts. Chances of the players to win are transparent. If you’re not convinced, they also publish the reports issued by the testing agency which you can totally check out anytime! 32Red has managed to gain the loyalty and appreciation of its customers through the sheer number of quality games and impeccable customer service and basically doing a lot of things right. The awards and accolades that the company has received stands as a testament to the statement. In our 32Red Casino review we discovered that they pay a lot of attention in their promise of transparency. It is very rare to find an online operator so transparent and honest about their services. Kudos to them! On the other hand, we are missing some of the big provider names, but all in all their slot offer is big and updated.